The notes tool allows learners to highlight and make notes about what they read in the body of the course. The notes tool is available for text, including text in HTML components. However, the tool is currently not available for discussions, exercises, video transcripts, or PDF documents. Learners can access their notes either in the body of the course or on a Notes page. 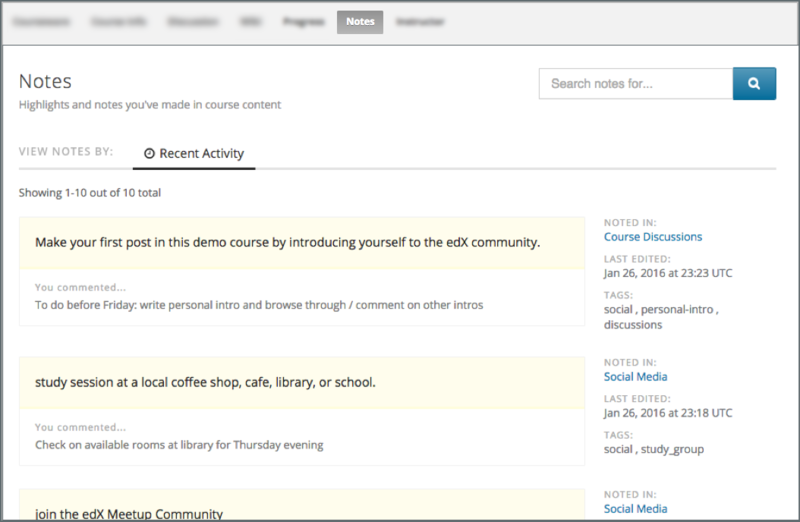 On the Notes page, a learner can see all the notes that she has made during the course. The page also contains links to the location of the notes in the course body. You must enable the Notes tool before learners can use it. To enable the Notes tool, follow these steps. In the Enable Notes field, enter true. For more information about the ways learners can use notes, see Taking Notes in an edX Course.